Walking through our cemetery in Princeton, New Jersey is not prescribed by our common rules. But it is a practice just about every confrere I know engaged in whenever they visited Princeton over the years and had a few moments. I have been doing it for some 60 years. As an 18-year-old, I saw them as just names. By the time I was ordained in 1965, I think I knew some 30 who had been added. I knew many more, not personally, but from the stories that were told about them. I would start at the top of the cemetery and just walk meditatively along the rows of simple headstones. Our Princeton cemetery officially began in 1934. The earliest markers were for confreres who died in the 19th century. They had been brought down from Niagara University. On one of my last walks through the cemetery, I was struck by how many rows had been added. But even more, I realized how many of the more than 450 confreres I knew that I had personally met and even lived with. I did not have to turn to ancestry.com. It was very much walking on hallowed ground. At every morning prayer, we remember those who died on that date in the past and how old they were. It is especially sobering to realize that I am now older by many years than these men who I once thought were old at 60 or 65. It was common in medieval monasteries to keep what is called a necrology, or a list of those who died. The necrology served not only to prompt prayers for the repose of the souls of deceased forbearers but also to remind the community of the ideals and experiences that particularly defined and distinguished them. When a confrere dies, our current custom in most houses of the community is to spend some time at the wake sharing our stories of the confrere. As one provincial once said, “I learn so much about the confrere that I never knew.” We can be grateful for the various incarnations of our newsletters from the Heri-Hodie to the copies homilies given to our archives, that we have vignettes to stir us on. One of the features of this website currently under development is a section telling the stories behind the facts recorded in our Vincentian necrology. We hope that it will allow more people to celebrate the confreres made this province what it is today. PS Visit an earlier post describing Fr. Lou Trotta;s 78 years of remembrance of our college prep and cemetery. Fr. Tom McKenna, CM reflects on how saints are bibliography for the story of Jesus. There’s a writer who characterizes the lives of the saints as “bibliographic entries onto the life of the Lord Jesus Christ.” A bibliography: a series of additions to the one story; i.e., variations on how Jesus’ story plays out, new and slightly altered versions of His narrative that are triggered off (in The Spirit) by different times and cultures and movements — and perhaps especially by seemingly unconnected and accidental events. In one way or other, these other stories retell the story. Or better, as they’re happening they are that One story as it’s in the process of being set out again for another age. But then come all the other saints, or as the bible says “the friends of God and prophets.” In one way or other, they are also re-tellings. They are like little tiles in a big mosaic, each giving off some of the light that shines through the founding story which back lights them all. They’re not the exact same as Jesus story, but indeed variations on it, elucidations of it for particular times and places, “remakes” of the original version each one of which sets that story more snugly and recognizably into some later age. And how well we in the Vincentian Family are familiar with those “remakes” made in the 17th century, those accounts of Louise and Vincent who in their attitudes and behaviors and works left especially vivid portrayals of who Jesus was for their day (and is for ours). But closer to home, there are the people we’ve known, both in our own families and especially those special ones in the wider Vincentian Family, who “told the story.” Their life histories recounted at their wakes and funerals and anniversaries have come to be appreciated as one version or other of the original. This line of thought provides a kind of gospel examination of conscience for all of us. How do we fit into that story in what we do and how we see and judge things, and in how much we pay attention to the One who’s always continually telling that story? – have I gotten into the habit of connecting what’s happening to me with what’s happening in that original version? – can I line up the dots of my story according to the much bigger pattern of the Christian narrative? – do I try to get my bearings by its stars, and find my meaning by viewing my history inside the overarching meaning of this all-encompassing story? Who does this? It’s the person who tries in her joy with Jesus’ delight as He spots the finger of His Father at work in the everyday world. It’s the individual who in a period of suffering follows closely along behind the Lord carrying His cross. It’s the person who at crisis times hands it all over into the loving hands of the Father. All of these are further “bibliographic entries,” biographies of Jesus Christ as His story gets remade, re-imagined, re-issued, and re-lived in every age. Do I see myself telling the story of Jesus in my life? Can other recognize my variation on the storyline of Jesus? Fr. Tom Mckenna currently lives in Philadelphia with our candidates in the Internal seminary or Novitiate. This reflection first appeared in FamVin. He has served as an advisor to the Daughters of Charity of the St. Louise Province. Prior serving a Provincial he taught theology at St. John’s University. Sr. Annelle Fitzpatrick continues her reflections on unsuspected opportunities for dialogue with our Muslim neighbors. She engages almost daily with Muslim students in her classes at St. John’s University and is struck by how much they engage with the story of Vincent’s captivity in Tunisia. This third reflection on unsuspected opportunities for dialogue with our Muslim neighbors. focuses on an event recorded in both the Quran and the Bible – the Visitation. In Asian cultures, such as Vietnam, Korea, China, Taiwan, Japan, bowing is more than a gesture of greeting. It is a recognition that another person is superior in rank or accomplishment. Bowing is an essential component of the Japanese tea ceremony. In Japan, students bow to teachers before class begins. Even within the martial arts, as one is about to inflict pain and defeat one’s enemy, the contestants bow to each other as a gesture of mutual respect and admiration for their opponents skill. In the Islamic tradition, the act of bowing is reserved for God alone! John the Baptist (recognized as a Prophet in the Quran) has for Jesus. Several Tafsir masters (experts in Islamic scriptures) believe that this subtle difference in the account of the Visitation is profound in that it reflects the incredible esteem given to Jesus in the Muslim tradition. While Muslims vehemently reject the notion that Jesus is the Son of God, they do, however, recognize Jesus both as a Prophet and a special Messenger of Allah. To me – that’s a great starting point for dialogue! 1) If one looks today’s popular culture and reflects on how Americans spend both their time and money, what would you say Americans worship? 2) As parents, how do we keep our children from being swept up by the materialistic and secular mentality inherent in today’s world? Footnote: In the Hindu traditions people show deference by bowing or kneeling down and touching feet of an elder or respected person. Traditionally, a child is expected to bow down to their parents and elders during certain formal ceremonies. Little did Scott Jakubowski dream when he entered our internal seminary or novitiate that he might carry the relic of St. Vincent’s heart… through St. Peter’s Square… to the resting place near where Pope Francis would greet 11,000 Vincentian Family pilgrims… and, in a very real sense, share the vantage point of the crowd that Pope himself had. Yet that is exactly what happened during the recent Vincentian Family symposium! Scott Jakubowski (Western Province) and Cong Le (Eastern Province) from this year’s class joined Joseph Swariz (Austrian German Province) and Rok Zlender (Province of Slovenia) from last years novitiate class experienced all this as they carried the 150-pound platform bearing the reliquary containing St. Vincent’s heart. This experience gave a whole new meaning to “being formed after the heart of Vincent”. The first thing I recognize is the unbelievable opportunity to attend this symposium on behalf of both the Eastern and Western Provinces of the Congregation of the Mission and their benefactors! It was truly a once-in-a-lifetime opportunity and just being able to go was a true blessing! Also, none of this would have been possible if not for the dedication and hard work of the Vincentian Family Office especially Fathers Joe Agostino and Flavio Pereira Tercero and Daughters of Charity Francely Perez and Marge Clifford. So much of the responsibility of planning this incredible event that brough together people from 99 countries and many languages fell on their shoulders. They are truly incredible. Father Sy Peterka organized a group under the banner of St. Vincent’s Parish in Germantown and shepherded us for the week’s activities like a champion. Thank you God for these wonderful people. Thursday night, I attended the Miraculous Medal Novena held at the Archbasilica of St. John Lateran with Fr Jack Timlin and Joseph Swaris. We arrived at the Basilica (with standing room only) just in time to hear Fr. Carl Pieber call to order the symposium’s festivities with the opening blessing and multi-lingual rosary, followed by the Novena. It was such a joy to hear Fr. Carl and Fr. Joe Agostino leading and preaching along with the Vincentian Family. We were way in the back standing alongside family members from Cameroon, Kenya, the Philippines and many other nations! Unfortunately, Jimmy, Cong, Joseph, Rok and I had to rush away early in the afternoon to attend a rehearsal session at the Vatican for Saturday’s Papal Audience. At the Vatican, we were ushered through the San Uffizio Gate behind the Vatican walls and got to walk around the Papal Audience platform and up the ramp of St. Peter’s Square to where the Pope sat during the audience to practice carrying St. Vincent de Paul’s Heart. Wowee!!! Then we rushed back to the Palavacchia to hear more keynote speakers. The other seminarians and I had a walking tour of the Santa Sabina parks and the Keyhole of the Knights of Malta gate in the southern part of the city. We also ate a lot of gelato. Saturday morning, we all got up way too early and were at the Vatican before sunrise. The seminarians and I met the priest and the Daughter of Charity who were transporting the Heart of St Vincent behind the San Uffizio gate of the Vatican and stood by until we were ready to carry it at 10 am. We walked carrying the 150-pound platform with the heart through the audience and up the steps of St Peter’s Square to await Pope Francis. We all sat to the left of the Pope and had a great vantage point of the thousands of Vincentians and the Holy Father. After, we also carried the Heart down the steps of St. Peter’s back to the guard of the Vincentians. Many people were visibly moved by being in the presence of the Heart and the Pope stopped to venerate it for a few moments as well. Again, what an amazing experience! After the audience, the seminarians and I went up to the St Peter’s Copulaand toured the Basilica and bought lots of souvenirs for our friends and family. They also have a café up there, very conveniently placed for our Gelato! Saturday evening, I attended a soccer match at the Stadio Olimpico to see Roma v Napoli. Needless to say, I learned a lot of Italian phrases not suitable for repetition! Sunday, we loaded up on the buses from our hotel to Basilica of Saint Paul Outside the Walls for a mass with our Superior General presiding. I got a front and center view because I was asked to bring one of the gifts to Fr. Tomas during the Offertory. Wowee again! It was such a moving event to see and hear all the languages and countries represented and all the Vincentians priests sitting up front. A true inspiration! Monday, Jimmy, Cong and I went to Assisi. We were moved by the holy ground the city stands upon. I was privileged to join the Western Province priests Fr. Jeremy Dixon and Fr. Tony Dosen in a private mass in the Chapel of Peace in St. Francis’ Basilica. Another, once in a lifetime opportunity. We ate and prayed a lot there. So moving and inspirational. Tuesday, I took a train trip to Castel Gandolfoto visit the Apostolic Residence and see the lake. I took the Garden and Museum tours and was blown away by the beauty of the city. I had lunch on the lake and soaked my tired feet in the lake for 2 hours. There’s no denying God exists with such a peaceful and beautiful place as this city! Vincent and Louise started a revolution… of tenderness! So begins Sr. Peggy O’Neill, SC in her presentation to the Vincentian Family in Rome October 14. She picked up a theme from Pope Francis in a surprise video presentation earlier this year. It gives me joy to mention this here…here in Rome. Vincent truly believed in partnership in the church and that is why he listened, learned and trusted the instincts and wisdom of Louise. Together they imagined and gave birth to a movement that has inspired us all.They started a revolution of tenderness… a revolution to humanize and put a face on the stranger and the vulnerable. Our Founders knew the need to lock eyes and to join hearts with those to whom human dignity and human rights were denied. With zeal, with a passion, Vincent and Louise responded to human needs and organized institutions to keep charity alive, keep love expressed. Yes, we are witnesses to, and partners with them in that long evolution of service….. service given in both humility and simplicity. Vincent and Louise instructed all of us, the Vincentian family, to ask forgiveness of those receiving our help….receiving our love. How well they knew that the “giver is the getter and the getter is the giver”! It really was…it truly is… love touching love. Let us gather here these days with a genuine attitude of gratitude knowing,… that God still has faith in us… and knowing, that we still have faith in each other. Let us promise to touch each other and our world with, a tenderness that transforms and with a truth that challenges. Read some stimulating stories, and more by clicking this link to access her powerful and prayer-provoking reflection from the steps St. Peter’s in Rome. Click this highlighted link to see the 35 minute video of the presentation on Youtube. Are we on board with this revolution to humanize and put a face on the stranger and the vulnerable? How will people know we are on board? A highly respected long-time peace activist, Sister Peggyhas received many honors and awards including the 2008 Peacemaker Award of the Congregation of the Sisters of St. Joseph of Peace, and the 2008 Ciudadana Ilustre Award, which recognized her work on behalf of social and cultural development in Suchitoto. 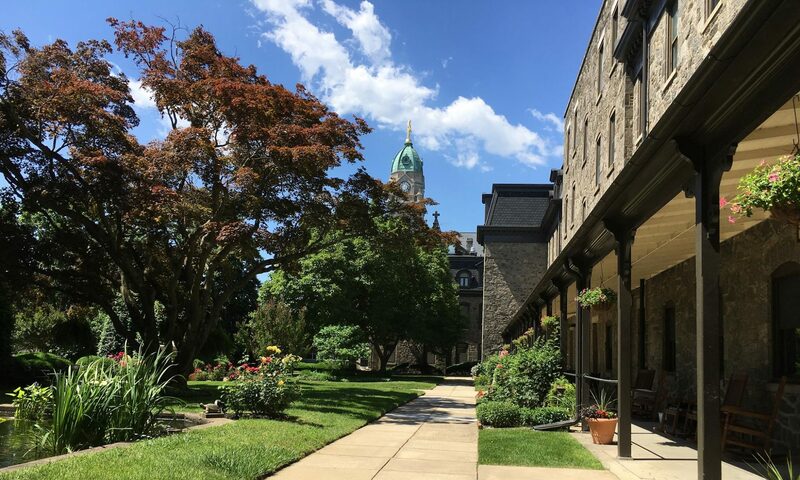 This spring the University of Scranton awarded her its Pedro Arrupe, S.J., Award for Distinguished Contributions to Ignatian Mission and Ministry. “Fueled by hope.” In the days immediately preceding the historic symposium in Rome, Fr. Pat Griffin shared the following reflection on FamVin, Now that the event is literally history and the texts of the various presentations become available, perhaps we can use this reflection as a lens providing us a “reminder of the extent of infinity” and fueling our hope. I have been to more than one Vincent event in the past two weeks which contained an opening prayer which included some passage from Pope Francis’ message to the Vincentian Family on September 27th. Different people, different circumstance, gave emphasis to one part of the letter or another. The sentence is loaded with encouragement and could give rise to a wonderful talk. (Note to self.) We are invited to be strong, happy, fruitful, and selfless. We are directed to be free, confident and creative. We are told to find, gush, respond, and invent. And we are compared to grain and rock. The Holy Father went to a lot of trouble to use as many dynamic, evocative words as he could reasonably fit in one sentence. And it all begins “in the glorious wounds of Christ”—a phrase which specially resonates in the Vincentian Family with our sisters, the Daughters of Charity. Our “Vincentian Family Symposium” which begins in these days orients us towards the future. Fueled by hope, we celebrate creativity, collaboration, and communication. And we always holds the service of those who are poor as our primary value. I am eager to read and hear and see all which our gathering will produce. In response to the encouragement of the Holy Father and the Holy Founder, I long for a reminder of the extent of infinity. Videos from Vincentian Symposium – In the unique setting of St. Peter’s Square in Rome, more than 10,000 members of the Vincentian Family from all over the world have had a very special encounter with Pope Francis. The day began in the morning, when lay and consecrated members of the many Vincentian branches began to congregate, hoping to receive the message that the Holy Father wanted to address to all. Testimonies, messages, songs, as well as the presentation of the Famvin Alliance against homelessness and the Vincentian film festival, preceded the arrival of Pope Francisco, around 12 o’clock in the morning. Will you come and follow me if I but call your name?– We all said “yes” to the unknown of being a VVC and living in the West End alongside our neighbors in need. Likewise, from a personal perspective, this “yes” was one of the hardest ones I have ever had to make so I imagine my community members have had similar experiences. However, although it was a difficult decision to make, I know God is calling me to be here for a reason and I feel honored to be given this experience through Him. Will you go where you don’t know and never be the same? – Our living space is intentional and one that we pray to grow in and through. God is changing our hearts every second and every day of being here. I have never been to Cincinnati before and I committed myself to taking that leap of faith to do something I have never done before and to go somewhere that I have never been. I am ready to “never be the same”. Will you let my love be shown? Will you let my name be known? – As a community we are trying to embody the Vincentian message through every action we take. Personally, I am seeing God’s face in our neighbors in such a profound and beautiful way. I am also taken back by my community member’s generosity to this question; they are all wonderful examples of Christ to me. Will you let my life be grown in you and you in me? – As I mentioned before, God is growing in each of us every day. However, I can personally say that I am feeling closer to God through my neighbors and co-workers, I am reassured that I am where God is calling me to be and I pray this closeness I am feeling only continues to get stronger. Will you leave yourself behind if I but call your name? – I am a twin and prior to this experience Isabella and I had only ever been apart for a short period of time. By coming to Cincinnati, I was in a very real way leaving myself behind because I have always been my twin’s follower and always stepped back to allow her to take the lead. For the first time ever, I am challenged to be my own person and grow as an individual. Will you care for cruel and kind and never be the same? – My community members and I feel passionately about our neighbors and the overall social justice system. From my end, I am doing what I can to promote a sense of community and equality among myself and those who I am serving alongside. While I can say that I may never be the same again through this experience, I am also striving to make sure my neighbors feel the same way through their encounters with the Society of St. Vincent de Paul. Will you risk the hostile stare should your life attract or scare? -When I tell people I am a part of a yearlong service program, I often receive the response; “why would you want to do that?” or, “don’t you want to get your life started?” These questions make me feel like I am risking the hostile stare because I know some won’t approve or understand my choice/calling to be here. However, I am firm that my life will flourish through this experience. Will you let me answer prayer in you and you in me? – I am enchanted by this question and humbled by its simplicity and strength. Although it is a question that is difficult to grasp, I am tickled by the idea that God is working through me, my community members, and the Society of St. Vincent de Paul as a whole to do His will and to be His hands and feet. While I can keep going through the song, I feel that the first two verses of this hymn asks all the right questions in regard to how I am feeling about VVC, my experiences with community and SVDP so far. Likewise, these questions resonate with me through the way they keep me in-line with the ways I should be living the Vincentian mission this year and beyond. I am very blessed to be here and I am very hopeful for my future as an advocate and Vincentian. Ana Davila is a graduate of Niagara University and a member of this year’s Cincinnati Vincentian Volunteers, where this article first appeared. Kevin N. Murray passed away peacefully on October 15, 2017 at age 92. Born May 30, 1925 in Philadelphia, Kevin was the son of Margaret (McGee) and John B. Murray. He resided in Blue Bell with his wife, Mary Elizabeth (Murphy) Murray and was preceded in death by his first wife, Margaret Josephine (Cunningham) Murray. Kevin was the loving father of Kevin Murray, Jr. (Joyce), Michael Murray (Nancy), Dennis Murray (Lisa), Sean Murray (Mary) and Meg Searing (Howie). He was the cherished grandfather of 16 and great grandfather of one. Kevin is survived by his sister, Mariatheresa Cardell, and was predeceased by his brothers, Fr. John B. Murray, Elliston Murray and sister, Jeanne Murray. Kevin attended North Catholic High School and graduated from Villanova University, class of 1950. He proudly served our Country in WWII in the US Marines and was a member of the Society of St. Vincent de Paul. Kevin was in the Food Business for over 60 years. Relatives and friends are invited to Kevin’s Life Celebration at Our Mother of Consolation Church, 9 E. Chestnut Hill Ave., Philadelphia on Tuesday, October 24th from 9-10:15 AM followed by his Funeral Mass at 10:30 AM. Fr. James Dorr, C.M., will celebrate the Mass. Interment will be private. In lieu of flowers, donations may be made to the Society of St. Vincent de Paul, 3004 Keenwood Rd., East Norriton, PA 19403. After 400 years the virtues lived and recommended by Vincent are still a dynamic force today. The Miraculous Medal Shrine expects thousands once again for its Annual Nine-Day Solemn Novena, November 13 – 21. Rev. Thomas Sendlein, CM, Associate Director at the Miraculous Medal Shrine, will celebrate multiple services daily during the nine-day Novena. Then, on Wednesday, November 22, Most Reverend Edward M. Deliman, Auxiliary Bishop of the Archdiocese of Philadelphia, will celebrate the Shrine’s Feast Day Mass, honoring Our Lady of the Miraculous Medal, at10am. The Shrine is located at 500 E. Chelten Ave. in the Germantown neighborhood of Philadelphia. This year’s Solemn Novena theme, “400 Years of Vincentian Charism – Dynamic Virtues for Today,” coincides with the 400th Anniversary of the Vincentians. The founding priest of the local Germantown Shrine, Fr. Joseph Skelly, CM, was a Vincentian priest. Fr. Thomas Sendlein, the preacher for all Novena services and Masses, will delve into Vincentian values – such as simplicity, humility, and self-discipline, among many others – relating these virtues to today’s world and everyday life. More information, including a detailed Novena schedule with specific topics and Novena prayers, may be found at www.MiraculousMedal.org/Novena. To share intentions to be placed at Mary’s Altar during the Solemn Novena, please visit www.MiraculousMedal.org/donate-now. The Shrine will stream LIVE each day at 9am, and all sermons will be posted online at www.MiraculousMedal.org and on Mary’s Miraculous Medal Facebook page (www.facebook.com/marysmiraculousmedalfamily). For more information about upcoming events at The Central Association of the Miraculous Medal and the Miraculous Medal Shrine, please visit www.MiraculousMedal.org. For more than 100 years, The Central Association of the Miraculous Medal has been dedicated to spreading devotion to Mary Immaculate and her Miraculous Medal, supporting the promotion of this devotion, helping the formation and education of seminarians, providing care to the aged and infirm Priests and Brothers of the Eastern Province, and supporting programs that provide assistance to the poor.